Even if you're lucky enough to have an outstanding fireplace, there are probably times when you wish that you could give it a slightly different look, a fireplace facelift, so to speak. If that scenario sounds familiar you should give this Pilgrim 3 Panel Old World Forged Iron Fireplace Screen a try. Its traditional design and rustic finish will give your fireplace a whole new appearance without the expense or unsightly surgical scars of a full-scale renovation. A Pilgrim 3 Panel Old World Forged Iron Fireplace Screen is also a great practical investment. Heavy-duty mesh and a sturdy iron construction allow this fireplace screen to provide excellent spark protection as well as keep small fingers from straying to close to the fire; there will be no more worrying about potential safety hazards with one of these hearth accessories around. Built-in handles and a folding design also make this screen remarkably easy to deal with when it comes to transportation and storage. But really, it doesn't matter whether you're interested in enhancing your fireplace's appearance or improving its safety. Effective, eye-catching, and economical, this Pilgrim 3 Panel Old World Forged Iron Fireplace Screen is a great value no matter how you look at it. 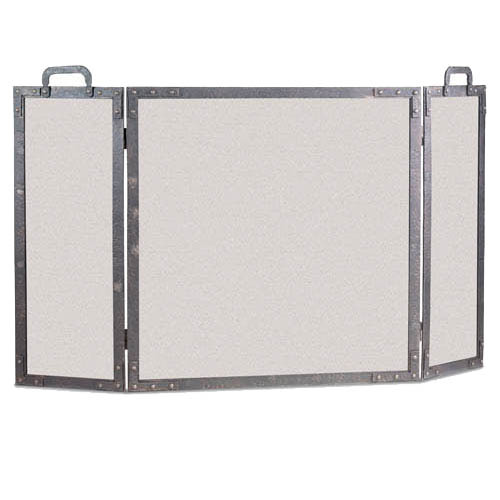 *Please Note: The listed screen size refers to the framed mesh area and does not include feet or decorative finials. Also, because this product is hand-forged, it may vary slightly from the dimensions provided. Please allow for an eighth-inch tolerance.